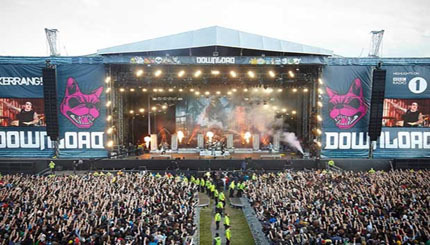 The Download Festival is a three-day rock music festival held annually at Donington Park, England (which hosted Monsters of Rock between 1980 and 1996, and 2002's Ozzfest). It usually takes place in June (although in 2003, the first day of the festival took place on the last day of May). The festival is owned and managed by Live Nation. When Download began, it took place on the Donington Park circuit infield as had Monsters of Rock. However in 2008 developments for Formula One meant that the infield was no longer suitable as a festival site. 2008 saw a move to the "Sunday Markets" site to the west of the circuit. Although adequate, numbers were limited and the location of the campsite meant that getting from tents to the arena was quite a hike. 2009 saw the festival move to a much more suitable location to the south of the circuit. Security for the festival has constantly been undertaken by professional crowd management specialists Showsec, although the campsite area has had various contractors throughout.